Jay DePolo, founder and principal agent of Ohio-based DePolo & Associates, is leading a community charity event to help provide support to Maci, an infant girl recently diagnosed with the rare congenital heart defect Mowat-Wilson Syndrome. Maci has undergone open heart surgery once before, and is scheduled for additional procedures in the near future. 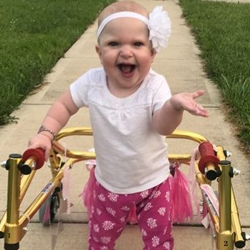 “Maci is a beautiful, vibrant young girl, and our agency is committed to helping her and her family during her battle with Mowat-Wilson Syndrome,” said DePolo. The firm is asking all residents in the Knox County region to be part of the charity drive by sending in friends and family members for no-cost quotes on insurance. For each person sent into the firm, the DePolo team will make a donation to support Maci and her family in their time of need. Further information on how to help support the charity drive is available here: http://depoloinsurance.com/rewards/. As a Personal Insurance Representative in Mount Vernon, agency owner Jay DePolo knows many local families. His knowledge and understanding of the people in his community ensures that clients of DePolo & Associates are provided with an outstanding level of service. Jay and his team look forward to helping families protect the things that are most important – family, home, car and more. DePolo & Associates also offers clients a preparation strategy for achieving their financial goals. To contact an expert at DePolo & Associates, visit http://depoloinsurance.com/ or call (740) 392-7106.